As I have noted in my twittering I have just successfully installed my new dvd recorder. This is no mean effort given my area of what some might kindly describe as expertise is in cultural studies and therefore in no way equips me to do anything practical or technical. So as I so twittily (and yes I have just made up that word!) noted, I am expecting an honorary doctorate in something related to electronics very soon. Because as we all know they have been awarded for equally dodgy achievements. Anyway, for those of you considering buying a new piece of technology here's a few hints. Don't give up on the instruction sheet if after one read through you are baffled. You might need to read them at least 4 or 5 times, and ring your parents/or other such helpful friends and family, and get them to describe what's hooked into what between their TV and DVD. Even then, you will need to persevere with the instruction sheet and try and use the long dormant, logical side of your brain to understand exactly what AV In is as opposed to AV out, as well as which ends of which cables go where. So after three years with no way of recording television (how I have survived I have no idea!) I can now theoretically do so. It will involve more experimentation and close persual of the instructions, but following this afternoon's great success, the world of dvds, tvs and recording between the two is my quite clearly my oyster. Did I really hear the host of Collectors use the term "intarweb" last night? I just don't know that the target audience for Collectors would be familiar with that word. But then, perhaps I am mistaken about the target audience for Collectors. Maybe I was drifting off as I waited to watch Elvis Costello on Spectacle. For all those concerned about my wedding footwear and the wedges verses stiletto heels debate, you may now sleep easy. I found a pair of shoes with a very low stiletto heel, black sandals with simple diamante and black bead across the top of my foot for....wait for it....$20!!! They were in the throw out bin at a shoe store in town here. Clearly the heel was too low for all the fashionable young things. And hey for 20 bucks I can wear them once and throw them out if I want to. I can walk in them also which is a bonus. I will however have to tidy up my feet as they are looking a little worse for wear at the moment. Pedicure time perhaps. Although it's doubtful that my feet will be the centre of attention. In my travels I also bought some 30% off stuff at everybody's favourite regional clothing store Target (jeans etc). And then I found an absolute bargain grey winter coat for $59 at an "exclusive" boutique (i.e. not a chain store). I can't wait to wear it if winter ever arrives. Also, I found a black wrap to go over my dress. So that's two wraps but one looks like part of the dress and quite frankly if it's freezing cold on July 4 I'll be quite happy to be double wrapped. I watched the movie of the same name last night. This version of the song is not in it (apologies for repeating myself for Facebook friends). How wonderful though, Rufus Wainwright, Moby and Sean Lennon together. Float through Friday on this one. 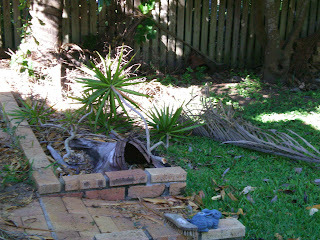 Anyway, after swearing never EVER to plant a palm other great gardening things were achieved this morning. 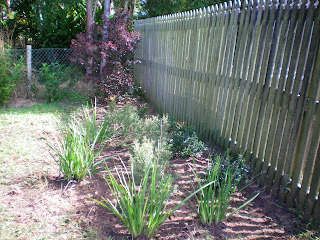 In my neverending battle against weeds, I have finally relented and put down pebbles and weedmatting in the front garden. See me with my trusty rake. If I can lift my arms tomorrow it will be a minor miracle. I'm not sure what the roses are going to think of being surrounded by pebbles. 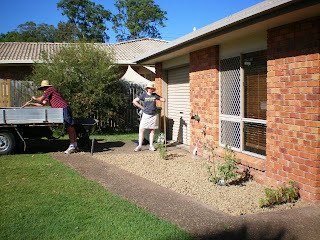 I also did a Peter Cundall style pruning on them. I was ruthless. Let's hope they recover. 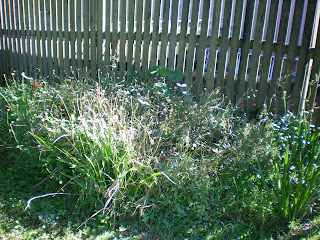 I call this photo "Once were weeds". I had shamefully neglected it all through the hot weather. After fifteen minutes with a hoe my father had it looking like this. See, there were actual plants in there. And finally, an update on the gum tree which was lopped off at the beginning of the year in order that I could get my front fence built. 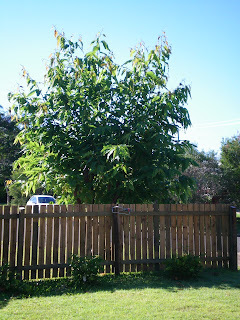 It's now my favourite tree in the garden. So beautiful. 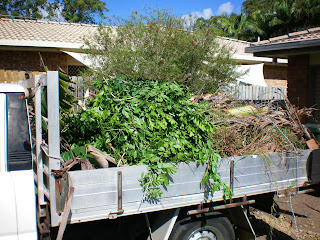 Who wants to go to the Regional Show when you can stay home and spend four hours in the garden carting dead palm fronds from the back yard to your father's ute? Hey? Who? I'm not hearing too much excitement out there in blogland! When I bought this house three years ago, it was quite evident that someone with a passion for palms of all shapes, sizes and spikiness had planted the original garden some years ago. I have spent many dollars having them removed by men with chainsaws and stump grinders. One remains - a golden cane - and let me tell you those men with chainsaws are returning very very soon to end its palmy life. Why? I hear you ask (or maybe not, because you're bored and have stopped reading by now. Whatever.) Because it never stops with the dropping of the dead fronds all over the paving, in the garden, on the grass or just generally where it chooses. Last year in January my wonderful gardening parents came round for the day and helped me clear out about 15 years worth of dead fronds. Here's what had built up since then. The ute is another whole post in itself. It's my father's pride and joy. It's also gradually falling to pieces, doesn't go above 50kph, is filled with all manner of junk, has wind down window air conditioning, split vinyl seat covers, and, I noticed this morning as we drove to the waste management facility (aka dump), a pair of rusty secateurs on the dash. When questioning the need for these to be permanently in the car, my father told me it was in case of a tree emergency. Frankly, they didn't look like they could cut through paper let alone any kind of twig. Anyway, back to the fronds. For the privilege or ridding ourselves of these scourges of the garden we paid $4 to the friendly council worker at the gate and drove to area 1. 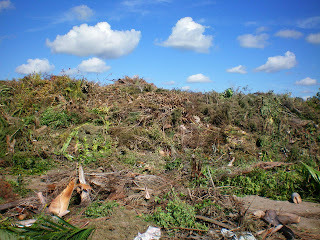 This was the final resting place for our palm fronds in a great big mountain of green waste, prominent in which I noted were palms. 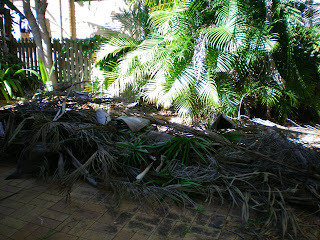 And on the way out, we saw two more utes packed with palms, driven by slightly dejected looking gardeners, no doubt wondering why on earth they ever planted the evil palm. "I'm Shaun either way aren't I"
Many years ago, I wrote my Honours dissertation on something I very grandly named "Postmodern Satire". The clip above from The Micallef Pogram was one of my central examples. At the time I had to rely on vhs recording technology and the coincidence that I just happened to be watching the ABC on the night it was on and my supervisor happened to record it. This evening while watching Shaun Micallef on the Channel Ten quiz show I was reminded of it. And look, ta da! Through the wonders of the internet and you tube here it is for us all to enjoy. I can't remember exactly what my argument was (it was a long time ago) but I think it was this sketch that really sparked my ongoing interest in television comedy and particularly, Australian television comedy. It's one of my all time favourite TV things. Enjoy. did i hear anyone say derivative? Television, usually my main source of inspiration, relaxation and entertainment has been less than fascinating over the last few weeks. I'm not sure why. I just haven't been that interested in it. Too much marking, eisteddfod, end of term etc. The Eurovision song contest was a pleasantly kitschy and engaging surprise but apart from that, nothing much has been noteworthy. Over the last few days I've watched a few things though. Spectacle with Elvis Costello on Friday evening on ABC2 was it's usually high quality self. The guest was Herbie Hancock. If there's one thing I'm not it's knowledgeable about jazz. I mean, I'm really a jazz dunce and have had never had a desire to learn more. I mean I'm always impressed with the technical proficiencies, love the standards, but often simply find myself wondering "where's the tune?". Herbie was articulate, interesting and a great pianist as Elvis asked a lot of intriguing questions. But still the thought that came to my mind was the wonderful line from The Committments that "jazz is musical wanking" (excuse me!). And I probably have remembered that properly either but it's rather a striking statement. Saturday was the usual Grandma's night in watching New Tricks. I love this show. It's all warm and comforting, with classy British actors hamming up their characters just the right amount, with an engaging mix of drama and comedy. I did some marking during SBS's new sports quiz show, imaginatively titled The Squiz ( did I hear anyone say "derivative"?) and then was taken by surprise as Rockwiz started early. My that guy from Presidents of the United States of America was fun as a guest. And it reconfirmed my opinion (stated previously here) that Julia Zemiro requires a live audience to be funny. As always, snappy and entertaining. The title of this post is self explanatory really. It's my cat. In a box. Once again I am breaking my own self-imposed ruling of "no cat pictures on the blog, facebook is the place for cat pictures" to bring you this hugely overweight bundle of grey cuddly cuteness. As well as squishing himself into this photocopier paper box which I left on the floor as part of my post-Eisteddfod mess, the cat has also begun a long term project of chewing the box to pieces. It does this by tearing at the edges whilst sitting in it. Sometimes one (and by one, I mean the cat) also takes a flying leap into the box from a vast distance, attacking the box as if one's very survival depended on conquering its all round cardboardy goodness. How can I possibly take the box and bin it now? It would break his little furry heart to have this game taken away. 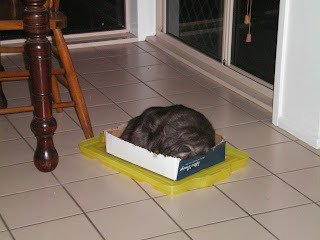 And look...in the time it has taken me to write this post he's fallen asleep in the box. Is cat. Is sleepy. 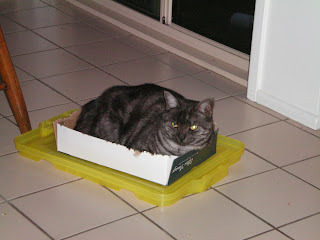 Is box. Is good. Q: Hi Wendy, what was the highlight of your day? Was it interviewing prospective students for the first time? Was it sending and answering many emails? Was it the lack of rain? Was it the peanut paste breadroll and mandarin you had for lunch? Was it the final student presentation? Was it tidying your desk? Was it the eisteddfod debriefing meeting after work? Was it watching Spicks and Specks? A: Well dearest blog, since you're interested it was none of those things. It was in fact the delicious homemade chocolate brownies that were packed into one of my plastic containers a friend returned to me. Yum. I have spent the last three evenings being inducted into the delights of the Eurovision song contest. It's never really been on my television or musical radar before but the enthusiastic liveblogging on Circulating Library and the expert commentary at The Memes of Production got me thinking there might be more this whole Eurovision caper than I had first recognised. So, I sat in front the telly, laptop on my lap and twittered my way through two semifinals and the final (although I did go to bed once the singing was done because I knew who won and was less than impressed.) I didn't stick around for the Olympic opening ceremony type entertainment. Because let's face it I've seen enough of those to last me a lifetime. Still, I probably missed something wonderfully Eurovisiony, like dancing bears, or a giant pink military tank. Anyway, I'm not going to get into a debate about who should have made it into the final (SERBIA) and who shouldn't (ROMANIA,) and who should have won (MOLDOVA, TURKEY or PORTUGAL), but I will say this I am now far more educated about the ways of Eurovision than I was a week ago. Firstly, fire is good, whether it be flames shooting up from the stage, or, more impressively, shooting out of the palm of your hand. Secondly, too many fireworks are never enough, especially if they spark up in time with the music not just at the end of the song, but during it as well. Thirdly, lighting. You can never have too much in the way of blinding lasers, light beams and all round flashing lights. Minimum level required - epilepsy inducing. More, it seems, is more. Fourthly, if you're going to wear national costume make sure you jazz it up with some garish colours, shorten all skirts to the point of indecency, and tighten all pants the same. Fifthly, it's not about the quality of the songwriting or the sincerity with which you sing. Some entrants made this mistake (Estonia I'm looking at you). Sixthly, (and this applies beyond the boundaries of Eurovision) Andrew Lloyd Webber is never a good idea. Ever. Neither are white grand pianos. Again I stress - ever. Seventhly, save the proper professional hosts for the final. Natasha and Igor (or whatever his name was) were suitably cringe-inducing for the semi-finals. MOscow kept the hosts who knew what they were doing and didn't make inappropriate remarks with regard the magic button for the final. (Well I'm guessing on this last bit seeing as I didn't stay up for the magic button part of the final). Eighthly, Australia isn't in it. However, our jingoistic national pride insists that Julia and her hosting friend found some tenuous link to Australia in the Greek entry. Ninethly, Julia Zemiro is not funny unless she's working in front of a live studio audience. I base this fairly unsubstantiated opinion on my viewing of Rockwiz and Thank God You're Here where she was much more entertaining than her Eurovision commentary would have you believe. Tenthly, well I can't think of a tenthly. But I'm sure with future viewings in the years to come, I will become more learned in the ways of Eurovision. "Representing Sweden were ABBA, a two-girl and two-man outfit with a song called 'Waterloo'. This one, built on a T-Rex riff and a Supremes phrase, was delivered in a Pikkety Witch style that pointed up the cretinous lyric with ruthless precision...The girl with the blue knickerbockers, the silver boots and the clinically interesting lordosis looked like being the darling of the contest...There could be no doubt that in real life she was squarer than your mother, but compared to Olivia she was as hip as Grace Slick, and this year..hip was in...As the girls clattered off in their ill-matching but providentially chosen clobber, their prospects looked unnervingly good. The hook of their song lasted a long time in the mind, like a kick in the knee..." (from Visions Before Midnight). Perhaps that's won it for Mr Norway. He was like a giant kick in the knee. With my brother's wedding fast approaching it was time to start looking for a dress that fitted the description on the invitation of "cocktail/formal". This is Bundaberg remember, so there's not a lot of choice in terms of great clothes although things have improved in the last decade at least. So my mother and I traipsed into the one proper formal/bridal wear shop with more than a little trepidation this morning. Well, what a delight. It was so easy! Personal, thoughtful service and within half an hour I was the proud owner of a little black chiffon dress, a chiffon wrap, some jet earrings and an faux antique beaded little black bag. My instructions were classy, but understated. I did not want to look like I was pretending to be 22. Nor did I want to look like I was going to a nightclub. And I especially did not want to look like I was trying to be a bridesmaid. (they aren't having any). They were very understanding. The only things missing from the ensemble are shoes. They put me in some black strappy things with stiletto heels and I nearly toppled over. Seriously, I had to hold on to the saleslady's hand to step out of them. They looked pretty good but I am not a high heel person. Not only am I hopeless at walking in them, they give me lower back pain after a very short time. So I will be searching for shoes between now and the 4th of July. don't we know this stuff already? I'd be keen to know if anyone is watching it, actually enjoying it and why? For me, it's quickly become a series that I feel I should be watching because it got such critical acclaim, however it takes a certain amount of restraint to stop myself flicking through the channels to find something else to watch. Although it must be said that in terms of providing insight into the world of advertising it's infinitely preferable to The Gruen Transfer. Although so is watching paint dry. Is there anything that cake can't make better? All I want to do is drink coffee, eat cake and sit quietly staring into space. The eisteddfod has sapped my energy reserves. Last night I was in bed asleep by 9pm and didn't get up til just before 7. I find myself having to go to work, catch up on many emails and phone calls, be interested in assessing and marking students (particularly since there are only three more weeks of term) and being my usual jolly and sociable self. (note to self: quit the self-directed sarcasm. Everyone knows I am not jolly). Monday saw me having to listen to students having meltdowns, offering tissues to them and making a number of appointments with the counsellor. I got nothing done that was hanging over from the week before. Yesterday, I managed to clear all urgent emails and phone calls, but this morning I was confronted with incidental unexpected things that meant the marking is still not started. Finally, at 11 I began and was immediately bored. So I put it aside, made a cup of tea and pottered about in an aimless fashion until class at 12. Then I left early (3:15) and went downtown for aforementioned coffee and cake (caramel and pear shortbread cake if you're interested). Suddenly, the day seemed a whole lot brighter. Is there anything that cake can't make better? You know what - I just don't think this is a good idea. There are some things in music that should remain as they are and not be tampered with in any way, shape, or form and I think The White Album is one of them. I've never seen what all the fuss about is with You Am I either. Yet again, I find myself a traitor to my Generation X stereotype. Oh well. Feeling a bit tired and cranky pants today it seems too. Last night at the Paul Kelly concert he sang so many hits from his back catalogue. Sadly, this wasn't one of them and it's one of my absolute favourites. Never mind. The rest of the performance was loud, fabulous, polished and just all round fantastic. I enjoyed every minute. Vika Bull was stunning on back up vocals and singing some of the songs herself. The support act was a treat as well. Minnesota bluesman Charlie Parr. I've never heard of him but he was all raw energy, smoking, fingerpicking blues. Here's one he played last night. Out shopping this afternoon I finally gave in and stopped for a coffee at Gloria Jeans with my mum. Now don't be alarmed, I have been to a Gloria Jeans before (I'm not from the dark ages, before there were mediocre coffee chains all over the place), just not the Bundaberg version which has been place for probably two years at one of our shopping centres. Like my decisions never to watch Forrest Gump or Titantic, or become a fan of Shane Warne, I was hoping to hold out a little longer on this mildly irrational resolution. As it turns out, I should have trusted my instinct. I was distinctly underwhelmed by the paper cups and plastic plates and cutlery. I didn't like the calling out of my name when my order was ready and I really didn't like that my so-called flat white tasted like hot sugary milk. Still, 1.95 for a piece of raisin toast, that was okay, I guess. How to rally yourself for the final day of a week long community musical event. Think of a song from a musical that has the same title as how you are feeling. One day more....Of course I'm not readying myself for a revolution. I just want a nap. Look for Alun Armstrong as Thenardier. Treat. I am incapable of forming any coherent sentences unless absolutely necessary, so that's all you get today. Day 4 of the Eisteddfod and one more full day to go. By 9am I had the mother of all headaches that no amount of panadol, black tea, green tea or coffee was shifting. In spite of this I did spend a very enjoyable session this morning listening to young pianists. Some very impressive 8-12 year olds coming up through the ranks. Over the last few years the piano sections have been a little bit abysmal so it was lovely to see some good work being done by some talented youngsters (and of course their teachers). This afternoon it was all about string playing, again with the younger age groups. Now we all know string playing is difficult and can be very hit and miss especially with the very young, but again, some wonderful work being achieved here. So far, the upset mother count has now risen from zero to 1. I smiled and listened politely and then kept walking. It's not my problem if the adjudicator chooses not give your child a Highly Commended. Be happy that they did their best on the day and then let's all move on with our lives. I see no sheep stations on the horizon. If I had my way there'd be no prizes at all. Yesterday and today were "yuge". If I walked up the backstage stairs at the Civic Centre once I did it a 100 times. If walked up the foyer stairs at the Playhouse Theatre once...the same. I am the queen of stairs. The sort of queen who really hates her inanimate subjects. I am sick of walking altogether. This morning I actually found myself thinking "hey wouldn't one of those Segways be a great thing to buy". It was then I realised I was in an Eisteddfod induced haze of tiredness that manifests in the form of ridiculous ideas. Probably not the best frame of mind in which to be interviewed for the local WIN news. I decided not to watch it in case it was just too cringeworthy. Apparently I looked tired. No surprises there. Five hours sleep last night as the evening session didn't finish until eleven and I decided that a good time to wake up would be 5am. Still, it's all been running relatively smoothly. At least there have been no parents complaining bitterly because their child didn't win. Scoff if you will at such a ridiculous scenario but let me tell you in the world of local music making, the Eisteddfod is big business, and it's happened many a time before. And now I'm too tired to think of anything remotely interesting to write. I have a little headache after Bundaberg Music Eisteddfod Day 1. Hmmmmm let's see...what of excitement happened today? Well, to start with at 8am I got a call from the accompanist in town who plays for let's say 80% of the competitors. She had a severe attack of vertigo on Sunday evening and was incapable of moving without dramatic and dire results. Accompanying emergency. Plans B, C and D were formulated in order to cover the students she was to play for this afternoon and this evening. This entailed a number of the other accompanists in town (myself included) sight reading music during performance. Stressful...just a little bit I guess. Everybody please cross your fingers she is feeling well tomorrow. Other than that, wonderful, enthusiastic and encouraging adjudicators are giving fantastic constructive comments. All volunteers have turned up to do their various jobs so far. Bonus. I have very sore feet from standing up all day and racing up and down stairs and wandering round venues saying things like "ssshhh" and "yes of course I'll go and find your adjudication sheet for you even though you weren't here when I gave them out before". Tomorrow 500 children descend on the Civic centre at 9am to sing with their choirs and then funnest of all (yes I know that's not a word) an afternoon of concert bands and string orchestras, for which I will help rearrange the stage many times according to the very particular requirements of each conductor. And let me tell you some of them are more pertickular than others. Update 2: tomorrow evening...stay tuned. I was going write a long and witty post about the minor trials and tribulations of readying myself for the first day of the Eisteddfod tomorrow. I could have told you about shopping for necessary stationery, complete with an initial rant as to why officeworks isn't open on a Sunday up here. I could have also mentioned how running three different venues means three lots of everything - records books, chairperson instructions, ordering and sorting of own choice music, picking up keys and writing down instructions for entering venues so I don't set off any alarms (yet to be tested! ),okaying the volunteer roster to do the five-six jobs needed at every session, finding out if our two adjudicators have any special dietary requirements, planning my clothes for the next five days and actually writing a list of such that is now sitting on my desk. In between all that I finished a draft of a paper and just have some references left to chase up during the week before it is due. I also scheduled in a nap this afternoon. And I'm sure you would have found that all very fascinating. But I'm over it. I'm ready for the event to get moving. Tomorrow, sees us setting up at the two venues we start with and then competition beginning in the afternoon. I'm sure there are lots of kids all round town practising their pieces and feeling a little bit nervous. So instead let's enjoy this. Well thank goodness for ABC2 last night. I only wish I had realised Father Ted was on when it started at 8 and not just accidentally falling into it halfway through. Still Mrs Doyle's cake jumper made it all worthwhile. If you missed it, you missed seeing a knitted jumper cooked into a banana cake. As visual comedy it was a sight to behold. Then Spectacle again with Elvis Costello. My admiration and adoration of Elvis Costello is growing every episode of this series. Not only is the music fantastic, but here is a man who can speak intelligently about popular music with his guests. A bonus is his jaunty taste in hats. Last night's red number was a wonder. The opening song "If I only had a brain" was heartfelt and set the scene for Rufus Wainwright. I have to admit the Rufus Wainwright phenomenon has passed me by, but after listening to him speak and hearing his beautiful songwriting and singing, I am determined to seek out some more. Here's the final number where Rufus and Elvis were joined by Kate McGarrigle to sing the folk song, Willie Moore. And I think this is the mark of quality interviewing and disucssion about music, or indeed any topic. If it makes you want to seek out more about the topic, then it's done its job. Our own man in the hat could learn some lessons here perhaps. I got treated to free coffee. That's twice in two Fridays.